I was curious to see a sketch of which authors have been foundational for Rhetoric Society Quarterly (RSQ) and Quarterly Journal of Speech (QJS) for the last few years. RSQ has historically seen contributions from people in writing studies and QJS has primarily been a communication journal devoted to rhetoric, although in both cases those differences have been collapsing. To get a rough idea of who is being cited, I took the reference lists from each journal from between 2011 and 2016 and noted which authors were being cited together in the same reference lists. So for instance, if scholar A and B were cited in the same reference list, this would hopefully indicate some sort of relationship. For each co-citation of two authors, a count was tallied. With that data, I created a couple of maps with VOSViewer that represented networks of co-citations. 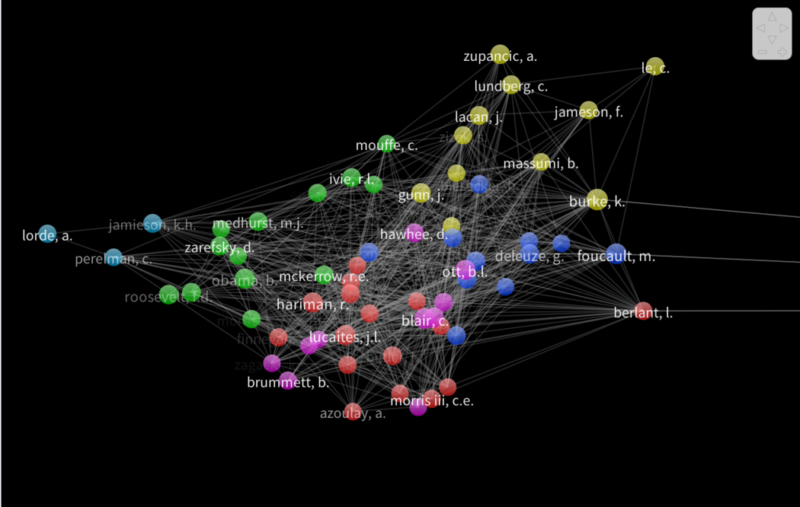 [caption id="attachment_1587" align="alignnone" width="960"] QJS Co-Citation Network of Authors, 2011-2016[/caption] [caption id="attachment_1586" align="alignnone" width="960"] RSQ Co-Citation Network of Authors, 2011-2016[/caption] In these graphs, the closer the authors' names, the more they were counted together. The colors indicate clusters, which were constructed with the VOS method, of related authors. 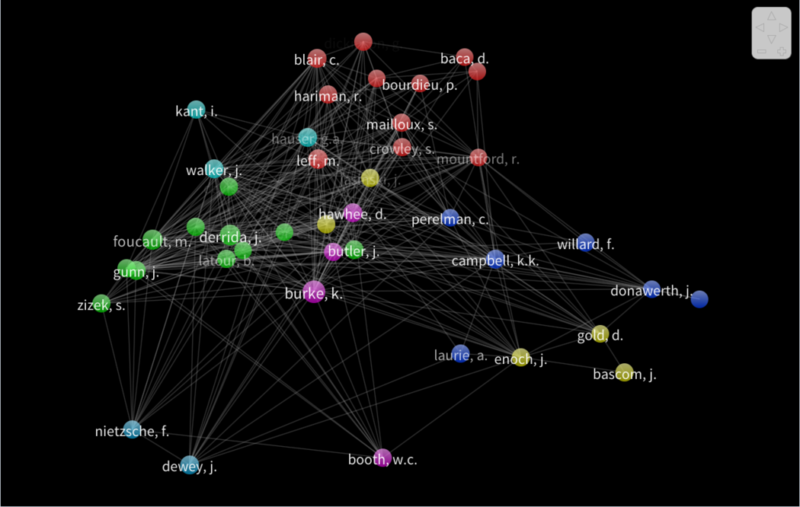 The closer the clusters, the more the authors were shared among authors in each cluster. I didn't spend a lot of time cleaning the data (fixing author names and typos in citation lists), so these graphs really aren't authoritative. Still, it gives a compelling representation of scholarship clusters in the two fields. In the QJS graph, you can see six different clusters. Farthest to the left, I might describe the teal cluster as a New Rhetoric sphere (characterized by Perelman approaches). Next, I see something that looks like a public address cluster,--you can actually see FDR and Obama (yes, the presidents) as part of the network, likely because of a number of citations to an FDR/Obama speech or talk, which says something about the research/citation practices of that particular cluster. Next, I see something that looks like a critical rhetoric cluster, a newer critical rhetoric group devoted to gender, affect, and identity, a cluster of public memory, and a set of theorists constellating Lacan and Massumi, which I would have characterized as a psychoanalytic approach fifteen years ago, but which has really become much richer than those authors. Note that the authors listed have all been writing for a while, because being co-cited frequently means that you'd have to have had enough work out for a long enough time to be considered relevant to cite. In the RSQ graph, there's definitely overlap with QJS, but also difference that highlights the journal's difference in scope. Again, there's the post-psychoanalytic cluster, but there's also a close reading cluster (characterized by Leff and Mailoux), and a set of folks studying women in rhetoric (Enoch and Donawerth). I also see Burkeans, which weren't as strongly represented in QJS. That's my quick read of the graphs. I'd be eager to know what people who publish in these journals see.